Actions or a set of directions can be applied to any element added to the skin to create interactivity. 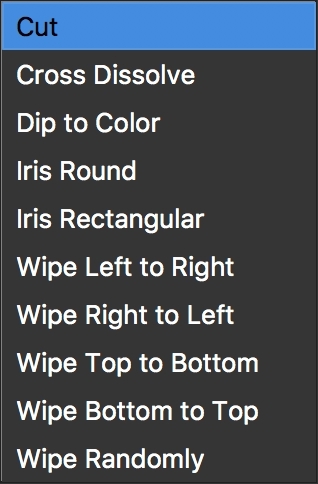 The actions are found in the Properties section of the Skin Editor for each element. Source – Choose which event will cause the action to occur. Action – Choose what will happen when the event occurs. For instance, if Pressed and Pan Left are chosen for a button’s action, and a user clicks on that button and holds down the mouse button, the panorama will pan left. Expert Mode is found in most actions and allows manual entry of certain properties. When setting a Target, the targeted element will highlight in the Canvas. Hovering your mouse over the target field in the Actions properties panel will also highlight the targeted element. Use the Action Filter to create a condition for that action. This can be used so that the action will only execute if the condition is true. The above states, to execute the action only if the current projection is Rectilinear. If the panorama is viewed in any other projection, the action will not execute. This action is commonly used on buttons that have an arrow indicating left or right. Applying this action to an interactive button or image will cause the panorama to rotate to the left or right. Direction – Panning is the horizontal rotation, therefore you can only choose from Left or Right directions. Speed – When you add a pan action, you get the option to adjust how fast or slow the pan will be. The speed is determined by a rate of degrees per frame. ✭ Entering the number, .40, will cause the panorama to rotate at a rate of four tenths of a degree per frame. This action is commonly used for buttons; especially ones that use an arrow indicating up or down. Applying this action to an interactive button or image will cause the panorama to tilt up or down. Direction – Tilt is the vertical rotation, therefore you can only choose from Up or Down. Speed – When you add this action, you get the option to adjust how fast or slow the panorama will tilt. The speed is determined by a rate of degrees per frame. When this action is applied to an interactive button or image, the panorama will narrow or broaden its field of view respectively. Direction – Choose to zoom In or Out. Speed – When you add this action, you get the option to adjust how fast or slow the panorama will zoom in or out. The speed is determined by a rate of degrees per frame. ✭ Entering the number, .40, will cause the panorama to zoom at a rate of four tenths of a degree per frame. An action for Object2VR only. 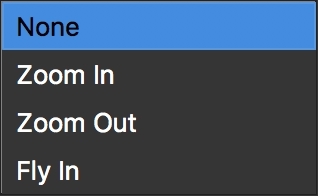 This action changes between continuous and drag modes in Pano2VR. Use this action to have an element in the skin change how polygon hotspots appear. For Show One, Hide One and Toggle One you will need to enter the hotspot’s ID to target it. Use this action to change the background and border color of a single polygon hotspot. Be sure to enter the hotspot’s ID to activate the setting. If you’ve added Lens flares to your project, you can use this action to show or hide them. You cannot target specific lens flares. Transition Type – Choose the type of transition. Effect Before – Set the effect that will happen before the transition takes place. Effect After – Set the effect that will happen after the transition takes place. Expert Mode – Expert mode will allow you to create even more precise transitions. Enable Gyro – Choose to activate the gyroscope. Disable Gyro – Choose to turn off the gyroscope. Toggle Gyro – Choose this action to toggle between Enable Gyro and Disable Gyro. Enable Gyro without Roll – Use this option to have the Gyro enabled, but without movement on the longitudinal axis (roll). The gyroscope’s state (active) can also be used as a trigger in a logic block. Toggle Fullscreen - Action will toggle between the Enter and Exit types. This action will start to rotate the panorama. Speed – The speed is determined by a rate of degrees per frame. ✭ Entering the number, .40, will cause the panorama to rotate at a rate of four tenths of a degree per frame. A negative number will rotate it counterclockwise while a positive number will rotate clockwise. Delay – The time it takes for the panorama to begin to rotate (in seconds) again after it has been manually moved by the user. Return to Horizon – Brings the panorama’s center perspective (horizon) back into view after it has been manually tilted upwards or downwards. A value of 0 will equate to no return, and an increase in the value will return the image to the horizon at a quicker speed. Expert Mode – Here, you can enter Speed, Delay and Return to Horizon in the Speed field. For example: 0.4/5/0.4. Use this action to stop auto rotation. Select this action to toggle between Start Auto Rotate and Stop Auto Rotate. Use this action to start an animation sequence based on the animation created in the project. Sequence – Choose the animation sequence. ✭ Once Auto Rotate is activated and after no mouse activity for 3 seconds, the cursor will hide. It will reappear when the mouse moves again. Apply these actions to a skin element to move the panorama to a specified point or view. This action will jump to the default view. This action will cause the panorama to move back to the default view. You can specify the speed of this movement. Speed - The speed is determined by a rate of degrees per frame. For example: Entering, .40, will cause the panorama to move at a rate of four tenths of a degree per frame. Easing Function - Choose the interpolation between views. Expert Mode – Select to manually add the Speed and Easing Function. Pan – Enter the Pan value. Tilt – Enter the Tilt value. FoV – Enter the Field of View value. Expert Mode – Select to enter the exact location of the view using the Pan, Tilt and Field of View parameters. Enter the parameters separated by forward slashes (/): 324.0/-3.5/70.0 (Pan/Tilt/FoV). You can also enter Projections using the numbers listed above. This action will cause the panorama to move to the specified view. You can set the speed of this movement and the easing function. Speed – The speed is determined by a rate of degrees per frame. For example: Entering the number, .40, will cause the panorama to move at a rate of four tenths of a degree per frame. Expert Mode – Select to enter the exact location of the view using Pan, Tilt and Field of View, Projections and Easing Functions. Enter the parameters separated by forward slashes (/): 324.0/-3.5/70.0/4/1 (Pan/Tilt/FoV/Projection/Easing). Speed can also be added here. Apply this action to an element to change the current view’s projection. Expert Mode – Select to enter the values for Projection and Speed as numbers. When an element is given this action, interaction with this element will send the user to a specified URL. It is generally good practice to use this action for opening HTML files or web links. URL – Enter the path of the web page or HTML file. You can also enter a placeholder here. For example, $hu will call the URL used in the URL field of the Hotspots Viewer Mode. Use the Edit button (to the right of the URL field) to open a larger text field to allow easier editing of the URL. Target – Add a target to specify where to open the website. You can also use placeholders here. For example, you could use $ht which will use the target specified in the Link Target URL field of the hotspot. Opens the following panorama. Pan, FoV, and Tilt can also be specified. URL – Enter the file name of an HTML5 output (XML) or web URL or choose from the list provided. If you are using Pano2VR Pro and have a tour loaded, you will see a list of the tour nodes to choose from. Enter URL - Add the XML or web URL. Default View - The view that has been defined in Viewing Parameters. In Expert Mode leave the Pan/Tilt/FoV field empty to use the default view. Expert – Select to enter the URL or node and Pan/Tilt/FoV. This action will jump the targeted element to the defined position. Offset X/Y - Enter the amount of pixels the element should move along the X and Y axes. Target - Select the targeted element. Expert Mode - Select to enter the Offset X/Y using a forward slash: 10/5. When this action is applied, it will cause the targeted element to visibly move from its current position to the position defined in the Offset X and Y fields. Transition Time - Set the time it takes for the element to change position. The default is 1 second. Toggles the element from its current position to the specified location. Use this action to change an element’s position to a set amount with each button click. With each click the relative position is changed. Limit - Select, Use Limits, to enable. Enter the total pixels the element should move. Useful for navigating flat images, image galleries and manually created thumbnail scrollers. This action functions the same as Set Relative Position except that the change along the path will be visible (as opposed to jumping to the position). For example, if the Offset is set to 10px for X and the Limit to 100px for X, the element will move 10 pixels to the right at every mouse click (or any other source), until it has moved the length of 100 pixels. Likewise, a setting of -10px for the X offset and 0 for the X limit, it will move the element to the left until it reaches the limit of 0. Use this to scroll elements into view that are inside a Scroll Area but are out of view. Set the x and y offset to scroll the content of a Scroll Area. The target must be a scroll area. This action will rotate the targeted element. The change will be jerky. Angle – Set the angle. Target – Choose which element will be affected by the action. Expert Mode – Select to enter the angle as a float value. This action will rotate the targeted element. The change will be smooth. Transition Time – Define the time it takes to transition from the starting angle to the angle defined. Use this action to toggle or switch between default and specified angles. Show Element - This action will show the targeted element. Hide Element - This action will hide the targeted element. Toggle Element Visibility - This action will toggle between the Show and Hide Element actions. This action will adjust the opacity of the targeted element to the parameter set in the Alpha field. Alpha – Enter the amount of opacity for the element. Alpha is based on percentage values. The float value, 1, represents 100%, .50 represents 50%, etc. Select Expert Mode to enter a more specific value. The element’s alpha channel will gradually change from the alpha set in the element’s settings tab to the parameter applied in the Alpha field. Transition Time – Define the time it takes to transition from the default setting to the setting defined here. Toggle between opacity parameters. The parameter set in the Alpha field will be applied on the first interaction, then back to its default state (set in the settings tab) on the second interaction. The element will be scaled up or down depending on the parameter set in the Scale X/Y fields. The scaling will not be animated. Scale X/Y – Enter the scale parameters here. Scale is based on percentage values. Link X and Y Scale - Select to maintain aspect ratio. Expert Mode – Enter the scaling for X and Y as float values. The float value 1, represents 100%, .50 represents 50%. For example: .5/.25 will scale the element’s x-axis down 50% and its y-axis to 25%. The element will be changed to the scale parameters set in the Scale X/Y fields. The scaling will be visible (animated). The element will change to the specified scale parameters on the initial action, then scale back to it’s default parameters set in the settings tab. 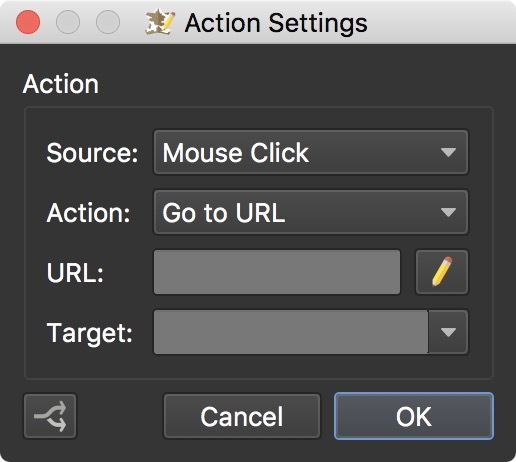 Use the Trigger Click action to prompt a mouse click action (without an actual mouse click). The Set Value action allows you to dynamically change elements. It can be used for example, to dynamically set file paths for the external loader to display different content. For example: Value = pictures/image01.jpg and Target = external 01. If you are outputting an HTML5 project, you can use this action to display framed content (video, objects, panoramas), using a textbox. If you’re using Pano2VR Pro, you can also use this action to filter node markers on a map using tags set in User Data. As an example, you could have multiple nodes of a tour - park, restaurant, lodging - that are tagged accordingly. Then, a button with this action would be assigned the Tags (separated by comma) as the Value and the Target would be the map. When the button is clicked, only node markers of nodes that have at least one of the given tags in their user data would appear on the map. Value – Enter the Value to be set. Use the Edit button (to the right of the Value field) to open a larger text field to allow easier editing of the value. Target – Choose which element will be targeted by the action. An action to playback the audio and video. Loop – Set the amount of times the media should play back. Target – Choose the media element that should be targeted. Any media files added to the skin or to the Viewer, will also appear in this list. _background - Targets background audio. _videopanorama - Targets the playback of a video panorama. This action will pause the targeted media. _main - Targets all media added to the project and the skin. This action will stop the targeted media. Any media files added to the skin or to the Viewer, will also appear in this list. Use this action on a button to toggle between playing the targeted media or pausing it. Any media files added to the skin or to the Viewer, will also appear in this list. Loop - Set the amount of times the media should play back. This action will toggle between playing the targeted media or stopping it. When playing after stopping, the media will return to its starting position. Use this action to skip forward or backward in a media file by a given amount of time. Time Difference – Set how many seconds the media should seek. Use a negative value to jump backwards. Target – Choose the media element that should be targeted. This action will let you activate any media element added to the panorama (in the Viewer). If you add this to a button, it will pop out the media (image and video) and play it (video and audio). Use this action to set the visibility of pinned images and videos. Choose the pinned media’s ID from the target list. Apply this action to a button to set the volume of the media to a specified level. It will jump from it’s current level to the level set. Level – Set the amplitude. The maximum loudness is 100% or 1.00 in Expert Mode. ID - Targets the media item with the given ID. Apply this action to a button to set the volume of the media to a specified level. It will gradually change the volume from it’s current level to the level set. These actions are for 360º Videos. Play - Apply to an element to play back video. Stop - Apply to an element to stop video playback. Pause - Pause the video. Fast Forward - Fast Forward through the video. Reverse - Rewind the video. This action can be used to change maps created in the Tour Map, or to zoom in and out of maps added to the Map element. Change Map - This will change the map that is being displayed in the map element. Zoom In - To zoom in on the map. Zoom Out - To zoom the map out. Map Bounds - This will recenter and zoom the map to it’s bounds to show all nodes. Map ID – Choose a map to change to. Target – Select the targeted skin map. Use this action to set a Variable that has been defined in the skin properties. Variable Name – Choose the variable to set. This list will be populated with the variables listed in the skin’s properties. Operation – Choose the operation you want to apply to the variable. The available operations will depend on the variable type. Value – Set a value for the operation. Only values that suit the variable type are possible. Expert Mode – Use this to use numerical values for the operation type. Learn how variables are used in the skin editor.